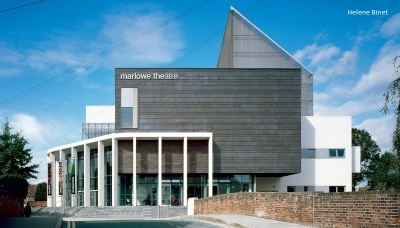 Canterbury’s Marlowe Theatre is a vibrant public building that is fully accessible to patrons, staff and visiting artists alike. 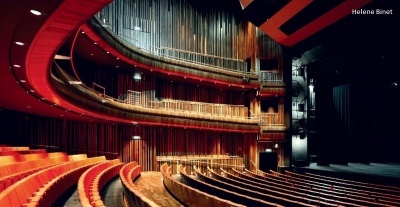 The theatre complex is well positioned to attract the best touring productions and shows as it offers two venues within one building: the Marlowe Theatre and auditorium, and the Marlowe Studio, a new, flexible, multi-purpose performance space designed to seat 150 people. This complex steel structure brings drama to the site, with cantilevering and hung structures defining different spaces and creating exciting open public areas. The flexibility of steel construction allowed the design team to develop a challenging structure with frequently varying floor levels in a cost effective way. The client was keen to ensure that a sense of flow and space was maintained in the foyer, improving pre-performance and interval movement and comfort levels, and leading to an increased use of the theatre’s facilities. An innovative steel solution was developed to achieve this and create a highly flexible and spacious front-of-house area. The first and second floor foyer spaces were hung from trusses in the roof. The hung foyer steelwork forms the backspan of the auditorium balcony cantilevers. To further ensure flexibility and drama within the foyer a cantilevering set of stairs was designed with minimal vertical support. This trussed structure was designed to incorporate the handrail and lighting detail into the top chord, maximising the structural depth and ensuring an adequate dynamic response. The new auditorium space creates a closer relationship between the audience and performers with no seat further than 25m from the stage. Services are integrated throughout the steel structure, with low velocity air distributed into the auditorium throughout the structure at floor level. The site identified for Marlowe Theatre was originally the location of a 1930s Odeon Cinema and had undergone several transformations, including the addition of a fly tower during the conversion to a repertory theatre in the mid 1980s. The decision was made to retain the fly tower steelwork as an integral part of the new theatre complex, and help to reduce the development’s environmental impact through the re-cladding and reuse of existing steelwork. A new steel framed pinnacle was designed to cap the fly tower and give the building a new iconic form, with a new tensioned mesh ‘jacket’. A major benefit of the rebuild has been the creation of the 150 seat Marlowe Studio. The smaller of the two venues, it cantilevers out above the café towards the river; adding further opportunities for performances at the site. The floor of this space has been designed to carry a collapsible seating system creating a highly adaptable space for future flexibility. The site’s proximity to Canterbury’s historic city centre, a highly regulated conservation area, was a major challenge, with the site categorised as a Scheduled Ancient Monument. During construction the remains of a Roman villa were discovered while excavating near the existing fly tower. The team developed a lighter steel framed core, which allowed for the implementation of a shallower foundation and minimised disruption to the archaeological remains and ensured the construction programme was unaffected. This project faced challenges from archaeology, flooding and incorporating the original fly tower, all in the demanding town-planning environment of historic Canterbury. The complex layout of the 1,200-seat theatre and back-of-house demanded very careful design and detailing of the crucial steelwork, which has proved most successful.